Are you over the Zumba craze and ready to try something new? 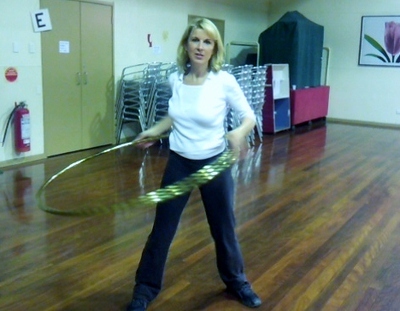 Ever thought about hula hooping those extra kilos off your waist? I know what you're thinking – swiveling your hips in a circle for an hour sounds boring. Well, let me tell you – there's more to hula hooping than meets the eye. It's not just for the ladies, men can learn to swivel just like Elvis. Come on, guys, I'm officially challenging you. Years ago I heard that hula hooping was a great way to melt off those extra kilos so I rushed out to buy a hula hoop. I searched high and low and finally bought one only to find when I got home that I couldn't swivel for more than 2 seconds. Well, I wasn't going to try the hoop out at the shop and make a complete idiot of myself. It's bad enough having customers watching but capturing it on the security camera was a risk I didn't want to take. These things could end up on You Tube. So, the hunt went on for the hula hoop. Three hoops later, I still couldn't swivel for more than 2 seconds, although my daughter didn't seem to have a problem. She swiveled like a pro. I put it down to old age – I had to face the fact that I'd lost my swivel. Fast forward to today when I was presented with a hula hooping lesson with Puzzle Dust Circus where the hula hoop was provided. Lesson number 1: The secret is in the hula hoop. I hadn't lost my swivel after all. I was using the wrong hula hoop. Puzzle Circus sells hula hoops which are specially hand made for $35. I think I wasted more than that in the dud hoops I bought. They are beautiful hoops and I was hooping away with ease straight away. Lesson number 2: There's more to hula hooping than simply swivelling. My lesson started with a warm-up which consisted of yoga stretches and progressed to waist hooping in both directions. It didn't take me long to discover the right side of my brain was dominant. Hooping to the left proved a challenge. It made me realise how important it is to make sure you challenge both sides of the brain. Hula hooping is fantastic for that. I was feeling like a smarty pants when the coach told us to start taking steps whilst swiveling. Another challenge. I love challenges, no matter how idiotic I look. Next, the arms got a work out. Well, let me tell you, as a newbie, I had hoop missiles flying in all directions. Our coach taught us a graceful way to pick up a hoop from the floor by using your feet. I tried the kicking the hoop up over my head method and nearly knocked myself out when the hoop hit me in the head. Very glamourous. Not. You want me to step where? So, a lot of tricks were learned in a one hour lesson and apparently I burned off around 600 to 800 calories. (I wonder if that included chasing the flying hoop around the room?) It was definitely a fun way to exercise. I highly recommend it as a great way to get fit and improve your muscle tone, balance and coordination. Believe it or not, every muscle gets a work out and it's a great cardiovascular workout as well. Lessons are in 6 week blocks in North Fitzroy. Bookings are essential. Check the details on the website. I've included a video to show you what I'll be like after years of practice. Why? Hula hooping is a great way to get fit and improve your muscle tone, balance and coordination.